This post is part of the Woman in Faith Series. I wish I could say I was not a worrier! I am not a worrier. Ha! I wish. My recent worries have been family, friends, dissertation, health, the list goes on! But the bible says not to worry. Be grateful and have a positive mind. I am grateful for my family, friends, opportunity to go to school, and my health. Putting a positive spin on things make life seem fuller. Which it is! Peace sounds pretty good to me. Worrying is like a rocking chair. It gives you something to do but does not get your anywhere. I am practicing positive thoughts in my life. How about you? Are you a worrier? 4 Rejoice in the Lord always. I will say it again: Rejoice! 5 Let your gentleness be evident to all. The Lord is near. 6 Do not be anxious about anything, but in every situation, by prayer and petition, with thanksgiving, present your requests to God. 7 And the peace of God, which transcends all understanding, will guard your hearts and your minds in Christ Jesus. 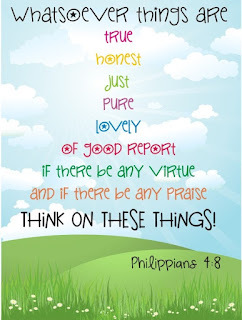 8 Finally, brothers and sisters, whatever is true, whatever is noble, whatever is right, whatever is pure, whatever is lovely, whatever is admirable–if anything is excellent or praiseworthy–think about such things.